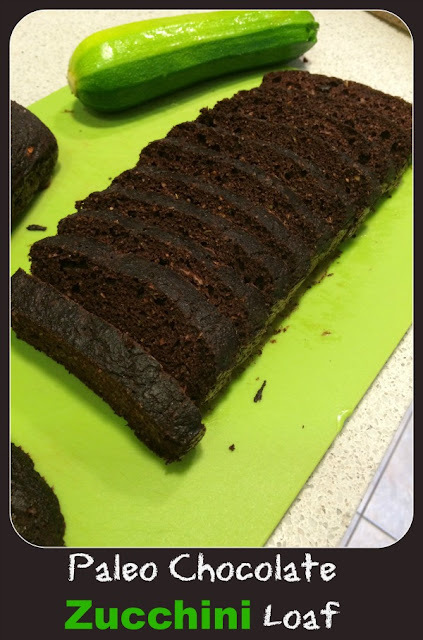 MamaEatsClean: My Go To Snack - Paleo Chocolate Zucchini Loaf - No grains! My Go To Snack - Paleo Chocolate Zucchini Loaf - No grains! My go-to snack. I literally eat this everyday. I freeze it in individual servings (two slices wrapped in piece of parchment and tied with twine) and take one out for my lunch kit each day. Sometimes I eat it straight up. Sometimes with a little bit of almond or peanut butter with jam. When I was being bad I used to top it with cool whip and strawberries (but my tummy didn't like that very much so I gave it up). I've swapped out the zucchini for pumpkin puree and it works just as well. Since I've made this recipe at least 100 times I would say its pretty fail-proof. Warning - its not overly sweet. Feel free to increase the sweetener factor or switch it up with another sweetener if Truvia is not your thing. I seem to tolerate it better than almost any other sweetener so that's also my go-to. If you can handle some extra sugar I'm pretty sure adding in a few chocolate chips couldn't hurt the taste factor either. Make sure you let it cool completely before you slice it (using a serated knife). Preheat oven to 350 degrees. I usually grease a glass loaf pan with grape seed oil and then put a strip of parchment paper on the bottom and it never sticks. Fully combine wet ingredients and dry ingredients in separate bowls. Mix wet and dry ingredients until fully combined. Remove from heat and let cool fully before slicing. I always make this as a double batch. I slice the loaf and freeze in individual servings.